Although Charles Darwin lived and worked in the 19th century, modern evolutionary biologists are far from exhausting all avenues of inquiry regarding birds and evolution. For example, in the 1990s, researchers such as Russ Greenberg, ornithologist from the Smithsonian Institution in the United States, began to explore a new question concerning the relationship between climate and the evolution of beak size. This question was inspired by Allen’s Rule, which states that warm-blooded animals living in cold climates will have shorter limbs and appendages than those that live in warmer climates. The biological mechanism behind this rule is thermoregulation—more body surface area helps animals to shed heat better whereas less surface area helps them to conserve it. Since a bird’s beak plays a large role in thermoregulation—it has lots of blood vessels and is not covered in feathers—researchers wondered whether hotter climates beget larger beaks and colder climates beget smaller ones. Indeed, studies revealed that climate has influenced beak size, but not which type of climate had more of an overall impact. Past research left a question open at the end: “Which of these functions is under selection?” Dr. Nicholas Ryan Friedman, a researcher from the Biodiversity and Biocomplexity Unit at the Okinawa Institute of Science and Technology Graduate University (OIST), comments. “Are birds with small beaks dying in the summer because they get too hot? Or are birds with large beaks dying in the winter because they get too cold?” In collaboration with scientists in the Czech Republic, Dr. Friedman designed a study to explore this question and ultimately found that winter, not summer, had more of an impact. The study is published the journal Evolution. Dr. Friedman and colleagues chose to tackle the question by recording variations in beak size in Australasian honeyeaters and allies. What makes this group of birds a great subject for this study is that the region they inhabit, Australia, New Guinea, and the South Pacific, exhibits huge variation in climate and temperature—from the tropical forests of New Guinea, to central Australia’s arid deserts, to the temperate forests of Tasmania. This means that it is possible to compare differences between individuals of the same species that are living in wildly different conditions. After measuring the beaks from 158 different species using specimens from the Australian National Wildlife Collection and comparing beak sizes to climate, the researchers found no correlation with summer temperatures but a clear one for winter—the coldest winters were associated with the smallest beaks, whereas warmer winters were associated with larger beaks. The top graph shows a correlation between beak size and winter minimum temperatures, with the smallest beaks relating to the coldest winters. The bottom graph shows no clear correlation for summer maximum temperatures. Before Dr. Friedman and colleagues reported this new environmental pressure on beak size, winter temperatures, feeding habits were believed to be the greatest driving force in beak evolution. For example, since the 1970s, Peter and Rosemary Grant, the famous duo who measured the process of evolution in real-time in the Galapagos, have been studying how beak size can change due to food availability over a short period. What is unique about Dr. Friedman and colleagues’ study is that it allowed for a peek into an unusually broad evolutionary timeframe. By comparing many different species of birds, the researchers were able to delve into a very distant past and discover the morphological importance of winter temperatures. The next step would be to better understand the relationship between these two factors—feeding efficiency and winter temperatures—in the overall narrative of beak evolution. 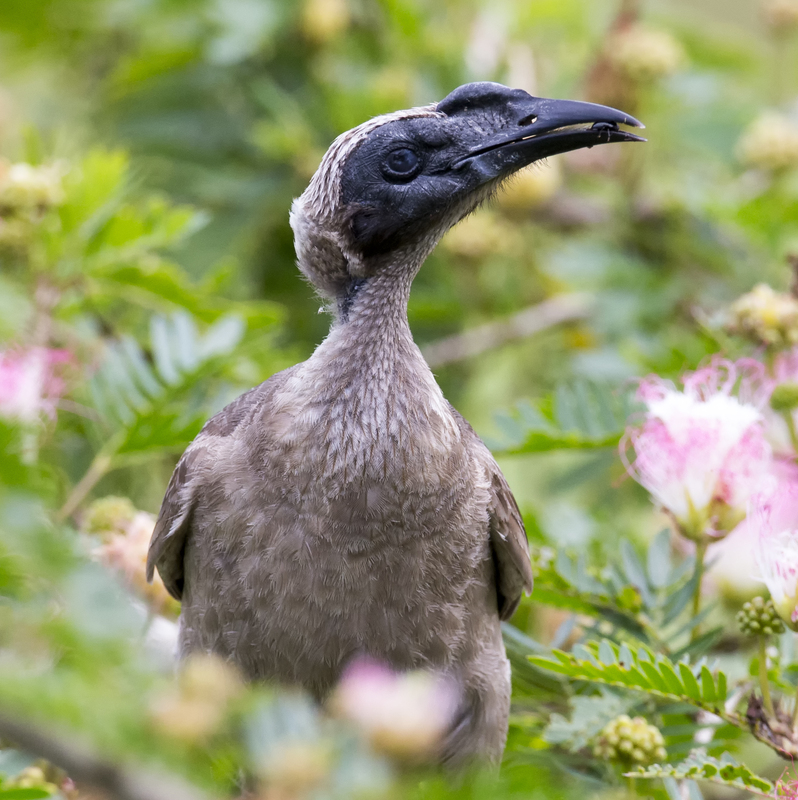 The Helmeted Friarbird (Philemon buceroides), a member of the honeyeaters, lives in Northern Australia and New Guinea. This honeyeater (Melidectes belfordi) lives in the montane forests of New Guinea. This photo was cropped from the original version（Flickr: https://www.flickr.com/photos/130781198@N06/19610332313/）.